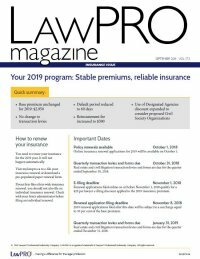 The Payor certifies that the information provided in the authorization form is correct and that the Applicant (or Payor on behalf thereof) will notify LAWPRO in advance in writing (and no less than ten  days prior to any payment date) in the event of any changes. The Payor certifies that the designated credit card or financial institution account is in good standing, with sufficient funds to cover the payments as they become due and that all person(s) required to provide authorization have done so. All payments will be drawn on Canadian credit cards or financial institutions only, and will be withdrawn in Canadian funds. The Payor and the Applicant acknowledge that LAWPRO may use and disclose their respective personal information referenced in this authorization form to each other (where Payor is not also the Applicant) and to the financial institutions involved in the payment process. For further information, please contact our Customer Service Department at 416-598-5899 or 1-800-410-1013; by fax at 416-599-8341 or 1-800-286-7639; or by e-mail at [email protected].